If you are a frequent camper, you should strive to be a good steward of the environment. After all, it is the beauty of national and state parks that draws millions of campers each year. As such, it is your responsibility to protect the setting you love. To preserve the delicate balance of our dwindling natural ecosystems, everyone must take part. If you are traveling or camping, RVs are an incredibly eco-friendly option for travelers, especially if you go with family or friends — especially if you buy small and travel light. However, if RV owners are not careful, camping with an RV can be just as bad, if not worse, for the environment than regular travel. To reduce your impact on the scenery you love, follow these green tips. With amenities like showers, sinks, and toilets included on many RV models, it can be easy to use a lot of water, very quickly. As the Department of Energy notes, every drop of water counts. Conserving water not only helps the environment, but it also saves you money too. Try taking fewer showers while on RV trips. Living rustically for a week or two makes you appreciate your utilities, even more, when you get home. When you need to wash your hair, consider a dry shampoo product, preferably rub over aerosol. If you do shower in your RV, save water with individual, water-saving shower heads, available at most camping stores. Conserve water spent on cleaning dirty dishes by planning fewer meals with pots and pans. 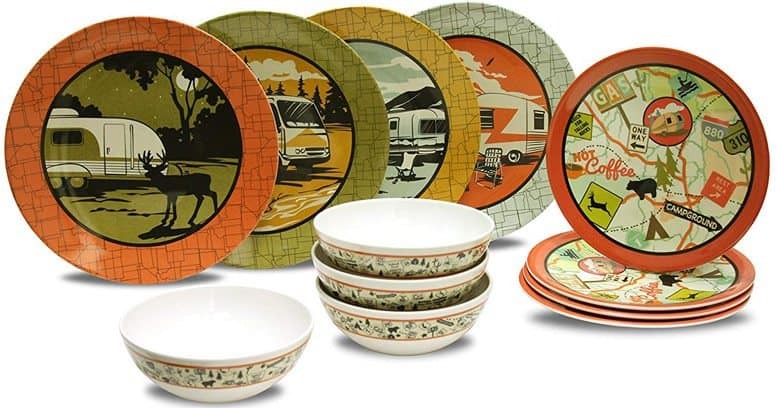 A barbecue is usually an excellent option for camping trips because of the quick clean up and minimal kitchenware. If you are about to buy an RV, consider getting one with a waterless toilet — flushing uses a lot of water. The United States produces around 258 million pounds of garbage every year. Much of the waste that collects in landfills run off with rain or seeps into the atmosphere. This pollution has drastic consequences on the environment. For you to reduce adverse effects on the wilderness, it is crucial to leave your campsite precisely as you found it. Try buying reusable dining and kitchenware — it might not be as convenient as disposable plates and cups, but they save resources, money, and waste. When washing dishes, use an eco-friendly soap that does not have toxic effects of groundwater. Make sure to clean up all trash and food, and recycle. Remember: reduce, reuse, recycle. Composting toilets are ideal when going on long journeys because you do not have to worry about pump outs. If you do have a water-based toilet system, make sure to clean your tanks system with enzyme-based cleaners. Other products can be much more harmful when dumped into our water supply. Fuel for flashlights, engines, air conditioning, heating and other appliances is both expensive and taxing on the ecosystem. Luckily, there are some easy, inexpensive ways to conserve. A finely-tuned machine saves money. You should always get your vehicle inspected before leaving on long or short trips. Also, make sure you properly inflate your tires before the trip. Doing so can save up to 20% or more on fuel efficiency. No need to get there in a hurry; make sure to go the speed limit when driving your RV. Driving slower allows you to enjoy the scenery and save some gas too. Also, try not to accelerate down hills, it is much more fuel efficient to coast. If available, try using biofuel: a specific type of fuel the produces much less greenhouse gas. When parked, try not to use heating or air conditioning units, unless completely necessary. Awnings and tree shade instead are much better options for keeping cool. If you are cold, stock up on blankets, thermal wear, and a warm sleeping bag. If you do laundry on the road, air dry it outside clothing lines instead of using a dryer. Every year, new, energy-saving technology becomes cheaper and cheaper. Why not bring some on your RV trip? Try replacing your battery-powered flashlight and lanterns with LED lights. You will save money not having to buy replacement batteries and oil. LED light sources use less electricity than traditional flashlights, and they are cool to the touch. No more getting burned on a hot surface. During the summer, solar panels are another excellent option for efficient, clean energy. Take the money you would have spent on a generator and put it toward a solar product. 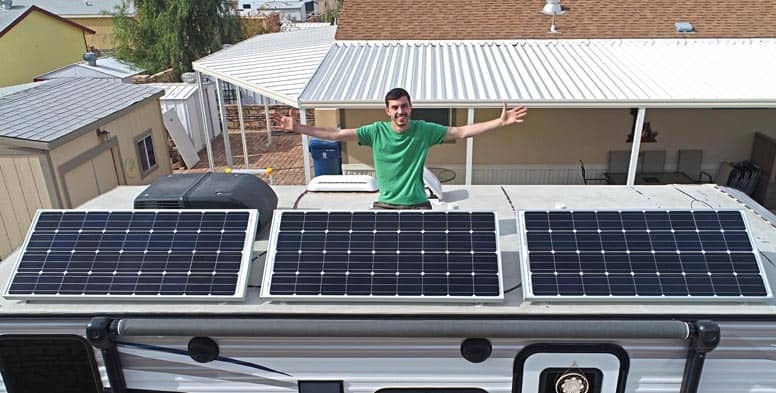 One RV solar panel can power almost all the electronics you will need on your recreational vehicle. While it is perfectly fine to appreciate untouched wilderness from a distance, or through hiking, RV camping can disrupt the delicate ecosystems that we know and love. When lodging for the night, pre-made campsites are much more preferable to remote natural settings. Try to find campgrounds that cater to green living with services like recycling. When done correctly, RV transportation is more environmentally-friendly than cars, planes, and trains. It is also a much more enjoyable and leisurely way to travel and enjoy nature. But it can be discouraging to pollute the very thing you love. Going green can save money, and lend you peace of mind. Take pride in the fact that you make active efforts to reduce your footprint when enjoying nature and traveling.